What is it about Christmas lights? 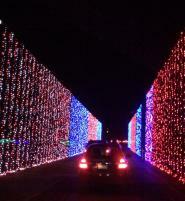 Recently, my family and I went out to look at lights. It’s a tradition for us to pick one night during the holidays and drive around endlessly to look at Christmas lights. We are not picky – we love all lit-up decorations. From blow-up Santas to lights on rooftops to simple mechanical reindeer – we truly love them all. And the more a yard is loaded with them, the more excited we become. But what is it about these twinkling, sparkly lights that captures our attention each year? I suppose it’s similar to a deer sighting – I have seen a thousand deer in my lifetime, yet every time I spot one I stop and watch them in awe. Yep, Christmas lights have the same effect on me and my family. We are in a trance-like state every time we encounter a fabulous display. There are lots of light shows in the area. But on this particular night, we had decided to venture to Coney Island for the CHRISTMAS NIGHTS OF LIGHTS. Even though we waited in line for a little over an hour, it was worth it to view this 2-mile dazzling show of sheer splendor! Our music was cranked up to match the light show, and we enjoyed this spectacle from the warmth of our car. Brilliant!